Jedi Temple For Sale, Cheap! If your Xbox 360 version of Star Wars: The Force Unleashed is missing an action-pack adventure inside a ruined Jedi Temple, Microsoft can hook you up with one this week at half price. It's time for the Xbox Live Deal of the Week, and this time around it isn't half bad. 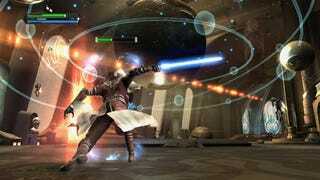 The Jedi Temple Mission Add-On for the Xbox 360 was one of those iffy add-ons that a lot of people passed up. After all, why pay 800 Microsoft points for a mission they included in the Wii, PlayStation 2, and PSP versions of the game but left out of the PS3 and 360 versions? Well how about 400 Microsoft points then? From now until the end of the week, the Jedi Temple is priced to move, so if you've a spare $5 lying around, there you go. I have the PlayStation 3 version of the game myself, so all I can do is weep.